Suicide Squad is a little over seven months away, but we already have a good sense of which characters will be a blast to watch. One of those is Harley Quinn, played by Margot Robbie. Other than The Joker and Batman, Harley is arguably the most recognizable DC character being featured in the movie. Despite not even being 25-years-old yet, the character has enjoyed immense popularity over her lifetime, appearing in numerous TV shows, video games, and on apparel. Corrupted by The Joker (played in the movie by Jared Leto), she’s more jovial and quippy than most supervillains, but this lighthearted demeanor doesn’t mask how insane and dangerous she truly is. If the first two trailers are any indication, it’s a good bet she’ll steal the show. 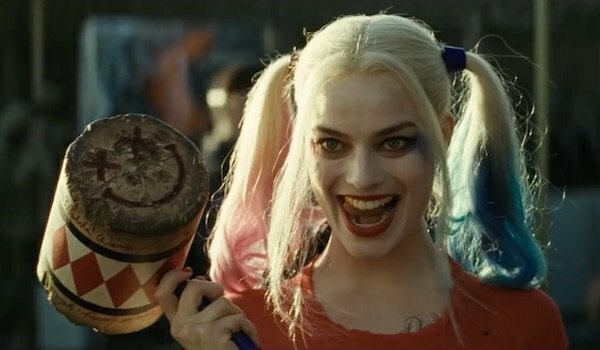 While the wait for Suicide Squad continues, we’ve gone ahead and provided all the important details about Harley Quinn. From how she got her criminal start to what she’s up to now in the comics, this is everything you need to know about her before you check her out on the big screen with the other DC villains on their dangerous mission. So if you’re in need of a Harley brush-up, you’ve come to the right place…though if she starts talking about the voices in her head, run! As you would expect, most of DC Comics’ characters are created for the printed page, but Harley is one of the few that got her start in another form. Her first appearance was in the beloved 1990s show Batman: The Animated Series, where she was voiced by Arleen Sorkin. Producer Paul Dini was inspired to create Harley after seeing Sorkin dressed like a jester in the soap opera Days of Our Lives. Originally Harley was just supposed to have a "walk on" role in "Joker’s Favor," but she was included in more episodes, and, well, the rest is history. It’s true that other comic book characters have been introduced on TV first, but Harley is one of the few that’s truly been propelled to popularity, to the point that even a lot of non-comic book fans have heard of her. It wasn’t until the 1999 storyline "No Man’s Land" that she made her first appearance in the main DC Comics continuity. Harleen Quinzel’s dream job as a child wasn’t to become a red-and-white garbed criminal clown. No, before she became a member of Batman’s rogues gallery, Harleen was a psychiatrist at Arkham Asylum. When she discovered The Joker, she immediately grew obsessed with him and immediately began conducting sessions to analyze him. Seeing how enamored she was, Joker began sweet talking her and lying about his past so she would sympathize with him. Eventually she fell in love with him, donned a jester costume, and broke him out of custody, happy to now be sharing a crime-filled life with her "Mistah J" (though she would soon be treated like an abused spouse). The New 52 also added him throwing her into the same vat of chemicals that altered his appearance, which we’ll see in the movie. The comics later expanded on Harley’s background and showed that she had issues before she met The Joker, but the Clown’s Prince of Crime manipulation was the the straw that broke the camel’s back. If Harley was merely a regular woman who dressed like a clown, she wouldn’t be that useful out in the field. Fortunately, she has a particular skill set for taking on opponents. While she doesn’t have any natural superpowers, she is a talented gymnast, so whenever ever she’s delivering a beatdown, it’s usually while jumping or doing backflips. Then there’s her arsenal. Although she’ll occasionally use standard firearms (there’s a brief shot of her using dual pistols in the latest trailer), she prefers wielding more absurd-looking weapons, including her oversized mallet, a comically large pistol that shoots a cork, and that graffitied baseball bat she’s using in Suicide Squad. Finally, in the DC Animated Universe and the comics, Harley was given a potion by her best friend Poison Ivy that not only made her immune to all toxins, but also boosted her strength, speed, and agility. It doesn’t look like Harley will have any special abilities in Suicide Squad (we don’t even know if Poison Ivy will show up in the DCEU), but she’ll still be a force to be reckoned with. The majority of Harley Quinn’s appearances have been in animated form, be it another cartoon like The Batman or a video game like the Batman: Arkham series. While Suicide Squad will be her first cinematic role, it’s not the first time she’s been seen in live action. The first was in the short-lived TV series Birds of Prey, played by Mia Sara. In the show she served as the mastermind antagonist, and while she didn’t wear her jester costume, her outfits did have the same red, white, and black color schemes. Harley also cameoed in the Arrow Season 2 episode "Suicide Squad" as one of A.R.G.U.S.’s many prisoners. We never saw her face, but her current voice actress, Tara Strong, provided her dialogue. The original plan was to eventually feature Harley on the Emerald Archer’s show, but after Suicide Squad and the other DCEU movies were announced, those plans were scrapped. Harley was also considered to be one of the antagonists in the abandoned Batman & Robin follow-up Batman: Unchained, where she would have been Joker’s daughter seeking revenge. For most of her existence, Harley has either been The Joker’s main squeeze or been adventuring on her own. It was only when the New 52 kicked off in 2011 that she was added to the Suicide Squad. After being imprisoned in Belle Reve Prison, she was forced onto the Squad by Amanda Waller rather than joining willingly. Most of her teammates underestimated her on the first mission due to her ditzy personality, but she soon proved to them how dangerous she was. When The Joker returned, she betrayed the team in an effort to find him, but when that didn’t go as planned, she rejoined. Despite only be affiliated with the Squad for five years, she’s remained a consistent member, ranking next to Deadshot and Captain Boomerang, and still serves on the team in New Suicide Squad. Since much of the DCEU is inspired by the New 52, it’s no wonder the movie decided to include her. Harley may have started out as a straightforward (albeit tragic) villain when she was introduced, but nowadays it wouldn’t be right to label her as a standard criminal. Anti-hero might be more appropriate in certain cases. In her latest solo series, co-written by Amanda Conner and Jimmy Palmiotti, Harley has been trying to get a fresh start on life and has moved away from being closely connected with Batman and The Joker. Now she’s actively trying to help people, though this usually has disastrous results. In many ways, she’s like Deadpool over at Marvel. They may try to do good, but often times it results in more chaos. The Injustice: Gods Among Us comic book prequel also showed that universe’s Harley working with Green Arrow and Black Canary, becoming a hero during Superman’s reign of terror. Whether we’ll see her take a similar path in the DCEU remains to be seen, though right now it’s not looking likely.